The comments on one of our early blog posts prove that many of you are totally hooked on Facebook. No surprise here because you’re reading a Facebook blog after all. And we found out the daily timetable of a “refacer” looks somewhat like this: Wake up, Facebook, Eat, Facebook, Eat, Facebook, Go to bed. One could argue that this schedule lacks minor events such as work, school or watching television. But let’s face it, you do all those things WHILE browsing Facebook, so they simply don’t count. Now for the biggest Facebook heads among you, there’s a way to blend Facebook into your sleep as well. A clever man from Chicago is creating Facebook pillows and is selling them on Etsy. Facebook is hard work, between the friend-ing and poking and tagging and stalking, it doesn’t take very long to get all tuckered out. That’s where this comfy icon pillow comes in. Now you can take your pokes offline and onto this perfectly plump Facebook pillow! This is a 100% handcrafted, 12″x12″ square pillow, made with the softest fleece and the fluffiest polyester filling, making it firm yet springy. Whether on your bed or near your computer, it is perfect for snuggling after a productive day of interneting, or to pound your fists into after you’ve been defriended. Check out the other pillows in my shop, they make great gifts. Pillows are made to order. Facebook is hard work, between the friend-ing and poking and tagging and stalking, it doesn’t take very long to get all tuckered out. That’s where this comfy icon pillow comes in. 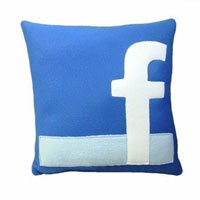 Now you can take your pokes offline and onto this perfectly plump Facebook pillow! This is a 100% handcrafted, 12″x12″ square pillow, made with the softest fleece and the fluffiest polyester filling, making it firm yet springy. Whether on your bed or near your computer, it is perfect for snuggling after a productive day of interneting, or to pound your fists into after you’ve been defriended. 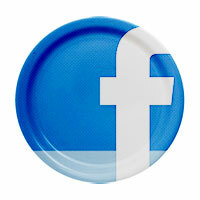 What's on your Facebook mousepad? Posted by Pieter on August 21, 2009 at 6:14 PM. Use this trackback if you're linking this story.